As SpaceX prepared to ignite its Falcon 9 rocket on a launch pad in Florida, its primary competitor for commercial cargo services to the International Space Station verified a Russian engine is more than able to drive the Taurus 2 booster toward space. Russian engineers successfully fired a stockpiled NK-33 engine three times in the last two weeks, totaling more than 600 seconds of cumulative run time, according to a statement by Aerojet and Orbital Sciences Corp. The tests occurred on a stand in Samara, Russia. "The success of the NK-33 engine tests in Russia is an important step forward in the development of the Taurus 2 rocket," said Ron Grabe, Orbital's executive vice president and general manager of its launch systems group. The goal of the Russian tests was to demonstrate the NK-33 engine's ability to fire twice as long as planned in future acceptance testing and during a real Taurus 2 flight. The firings were sponsored by Aerojet. The Taurus 2 rocket is being developed to launch Orbital's Cygnus cargo freighter to the space station. Its first launch from Wallops Island, Va., is scheduled for no earlier than March 2011. An earlier round of NK-33 testing was cut short in October because of an unspecified problem with a liquid oxygen system. One burn went as planned, and a second attempt ended prematurely. "We stressed the engine pretty hard, and we discovered some limits we want to re-evaluate in [another] test," said Frank Culbertson, Orbital's senior vice president, in a January interview with Spaceflight Now. This month's testing successfully overcame the issues encountered in October. "Completing the margin testing is a significant milestone in Aerojet's contract with Orbital," said Julie Van Kleeck, Aerojet's vice president for space programs. "This success demonstrates the engine's robust design and its ability to operate at the power levels and duration times compatible with the Taurus 2 flight profile with additional performance margin." Officials wanted to make sure the kerosene-fueled engine could still perform after four decades in storage. 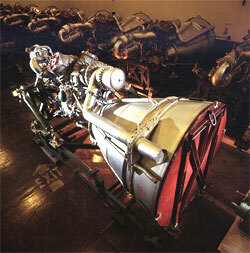 The NK-33 engines were originally designed and built in the 1960s and 1970s for the ill-fated Soviet N1 moon rocket. A modified version of the NK-33 engine, named the AJ26, is being prepped by Aerojet to power the Ukrainian-built first stage of Orbital's Taurus 2 rocket. Aerojet converts the NK-33 to an AJ26 engine by removing some harnessing, adding U.S. electronics, qualifying it for U.S. propellants, and modifying the system to gimbal for steering, Van Kleeck told Spaceflight Now in a January interview. Van Kleeck said Aerojet currently has 37 NK-33 engines at its headquarters in Sacramento, Calif. More engines are ready to be exported from Russia. A handful of NK-33 engines were fired in 1995 as Aerojet competed to supply the Atlas 5 rocket propulsion system. Another Russian engine was eventually selected to power the Atlas 5 first stage. AJ26 engine firings will begin in April, but those design verification tests will be of much shorter durations than the hotfires in Russia. Acceptance tests of flight engines will follow later this year. "With the performance of the heritage engine now confirmed and well understood, we can move forward with confidence to configuration verification and acceptance testing of AJ26 engines at NASA's Stennis Space Center in Mississippi beginning in April," Grabe said. The Taurus 2's solid-fueled upper stage was ignited for its first ground test in December.